These are tied on light wire single salmon hooks and a useful for salmon and sea trout on loch and river and in saltwater as well for that matter. 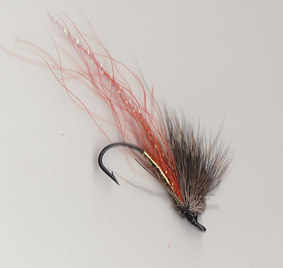 They are the sort of flies you need if you are heading to the Highlands and Islands. Tied with two fly 'Hebridean Casts in mind with the wake making Spiny Norman ideal for high wind conditions and the Muddler a better bet in lighter winds. If fish follow and boil at these flies change the point fly to a #12 International Black Spider or similar, salmon will take these small patterns more often than is realised, especially on the loch.